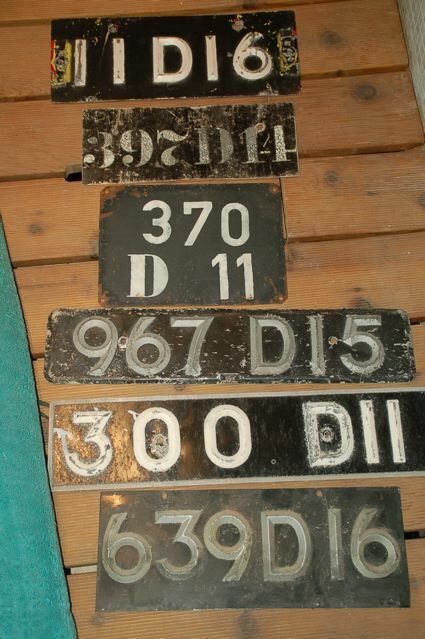 Before the ubiquitous Export Z-plates of the post-war years were seen all over Europe, as Germany stepped up her motor manufacturing with vehicles the whole world wanted to buy, another, simpler form of the unique oval licence plate had been born. Reader Hassan translates: “Second to last car from Berlin… Captain Sigvard Drake of the P-4 (armoured) regiment, Skövde, narrates an exciting trip home from Berlin in his Ford Eifel Cabriolet in the letter below. (letter absent -Ed) The picture is taken outside of Hedberg’s (Ford Dealership) in Malmö” Thank you Hassan. Who would like to write a covering piece about this historic temporary series? 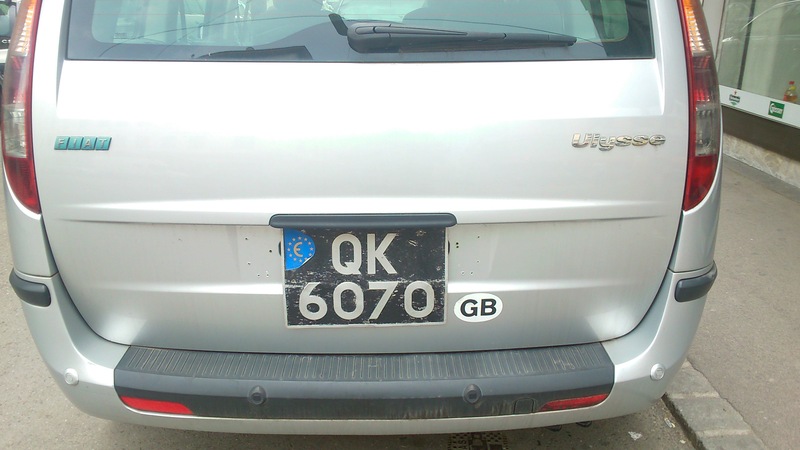 I found this car last week and could recherche (I found) that an Austrian citizen used this Austrian unregistered car for the last five years with this historical British import-plate. 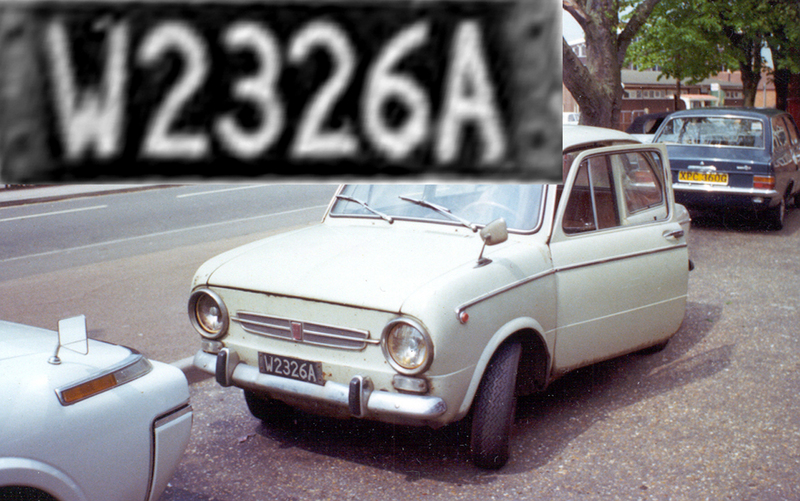 He parked and drove in Vienna without a driving licence and also had some troubles with police in respect of alcohol, but the discrepancy of the faked British registration never came to light… QK is a circa 1964 issue! 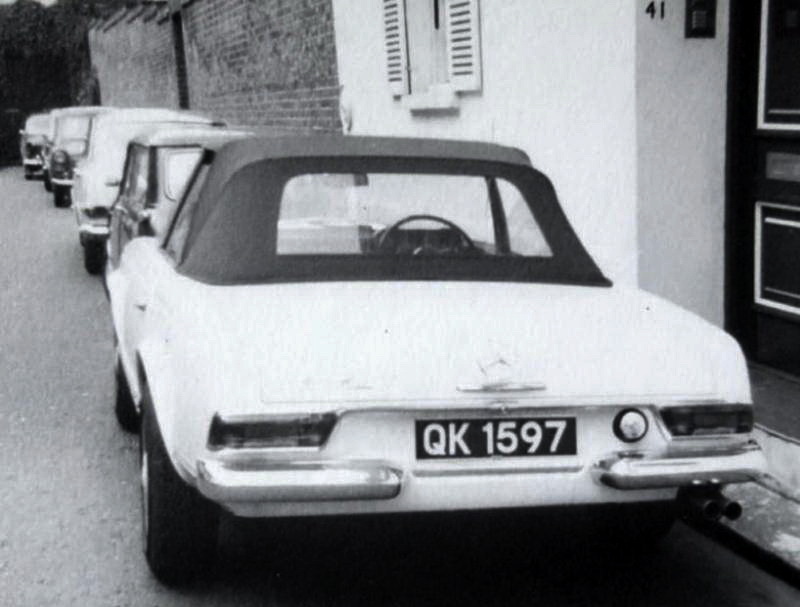 In 1964, when QK was a current issue, this new Mercedes was purchased in England for subsequent export, and so was issued with a ‘Q’ plate for it’s temporary stay in UK. The ‘Q’ series had a long history in Britain, starting in 1921. Another use for them was to temporarily register a visiting car from a country which did not subscribe to the international conventions. Thus they were unable to circulate using their foreign registration plates. This vehicle entered GB for a rally in 1932, and the Automobile Association issued it this QE 475 tag for the duration. The AA and the RAC were authorised to allocate these plates on behalf of the State, to facilitate motor tourism, as all the complex services were offered by those two venerable Clubs. 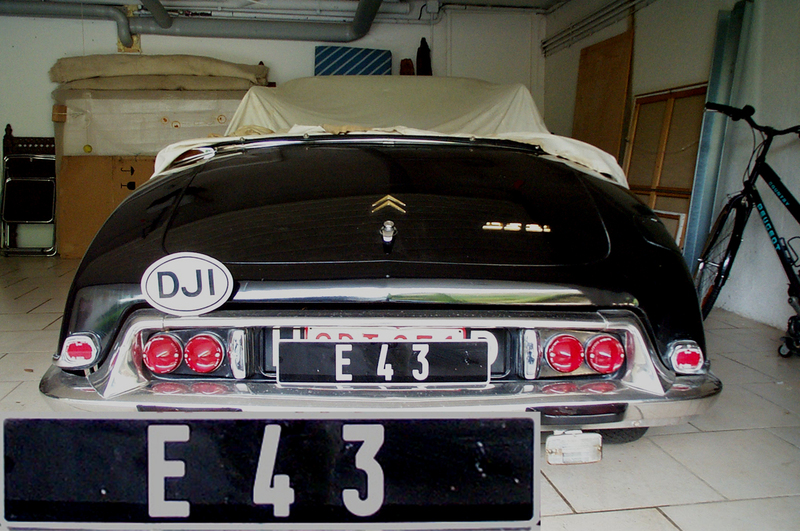 Non-member collector André Mas has been hoarding odd items most of his life and amongst other things, has accumulated a prodigious collection of rare numberplates which the writer photographed in France 06 a few years ago. André had found a rare Citroen DS21 Déesse Décapotable rotting in a yard in Djibouti whilst he worked there and he determined to repatriate it for restoration in UK. 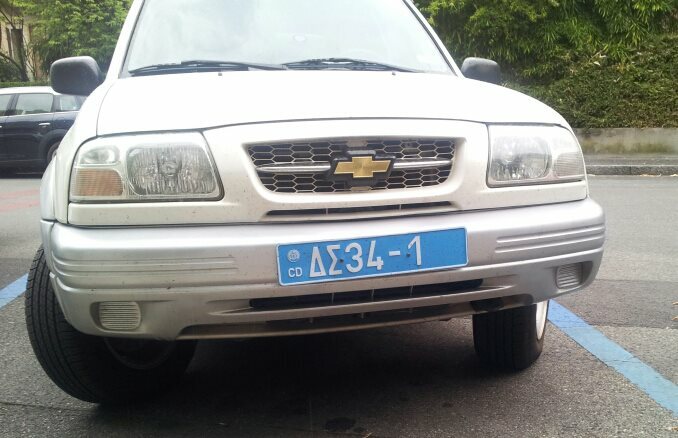 It continued to sport it’s Djibouti État registration E 43. He found that it had been brought to the French territory as a conveyance for President de Gaulle’s official visit and had been fitted with a sturdy balance rail across the rear passenger well, to stabilise the tall general, should a rebel chase ensue around the backstreets of Djibouti Town. It was André who obtained/had made the international oval DJI – perhaps the only one in existence? Ever? Has any member, or known source, a picture of the French Somaliland colonial plates which preceded independence in 1967? And pictures from the 1967-77 period when it was titled the Territoire Francaise des Affars et Issas? 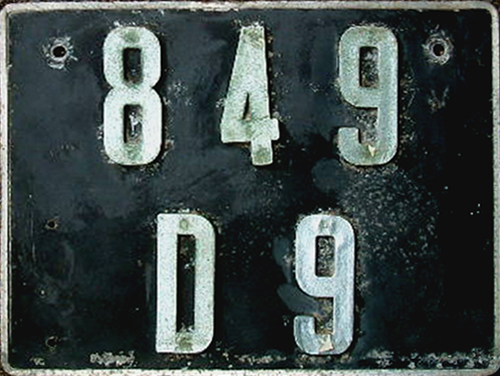 From 1960 to about 1970, the final numeral (the ‘9‘ in 849 D ‘9‘ below) was a year-of-issue marker – thus this plate is thought to be a 1969 issue. From 1970 the latter 2 numerals (possibly starting with 11 rather than 10) were simply thousand counters as normally given in prefix (11 123). (Why not just print 11123??) 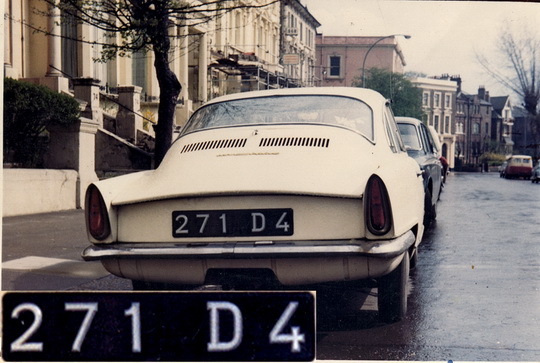 Morocco also used this dating scheme with its TT plates during the 50-70s, but it gave rise to duplication (1955/65/75). Thus the multiples above were post-1970, whereas 849 D 9, below, is pre-1970 (1969). Djibouti was the subject of my most costly contribution to my hobby. Deciding to go somewhere really unusual for a week or so in the 1980s, and knowing an exec. in a hotel group, I picked the former French Somaliland, where he ran a grand pension in which he granted me a room. It may have been the only building in Djibouti with more than one floor. Travelling via the French third-world aerodrome of Le Bourget, from London, my flight touched down at midnight in the North Sahara, and I was one of four westerners on a flight carrying about 20 people. The locals melted away into the hot night, with no visible checks through customs or immigration but we Euros were challenged for our visas. I had established that no visa was required, before leaving London. The other three Brits were old hands. They worked for British Telecom, which maintained the Djibouti phone system, and were frequent visitors to fix equipment which was eternally being fiddled with by unknown hands. Something untoward happened every time they tried to enter or leave and they were inured to procrastination. In the francophone exchange which ensued, it transpired that foreigner visa requirements had changed in the previous weeks/months, but the team of former cameleers eventually admitted that since the change of rules, they had not yet been able to afford to advise The World At Large of the changes. Naturally, The Rule still applied, however – the prophet be praised. Our techmen demanded to speak to their special mate, the Minister of Telecomms, who would spring them from that dusty, hot tent – along with me, whom they had now kindly decided to adopted as their bag-carrier/general factotem. I would be borne through under their general laissez-passer. The Minister was run to ground under some ladies in the Tin Palm Nite Club at 2 a.m. and BT hailed him familiarly as ‘Jacko’ as he sportingly took the telephone call with his free hand. Having heard their problem described, he told them to pass their phone to his mate, the chief of customs and immigration, the official with the least grubby blanket swathing him from head to dusty foot. A noisy one-way tirade took place at the ear-piece, after which an embarrassed ‘Welcome to Djibouti’ was profferred to the technicians by the assembled group of customs and immigration bods, who, on reflection, did rather look to be out of it on Qat, their sharia-cleared drug of choice.. They were not convinced that I had the credentials to climb telegraph poles, however, and despite the protests of the might of BT, I was held back for private interview. Failing to recognise the encouraging signals emitted by third-world power-brokers, I was eventually formally refused entry at 0300 and told to go back out on the returning morning flight, and come again with a visa some time. Predictably, I never went back, and I never got even one photograph of a Djibouti plate, though I did see a red TT plate with arabic on the tarmac tanker, when we were taxi-ing. The French aircrew had all stayed a refreshing night at the same grand hotel to which I had been bound, and were amused at my plight. I think I was the only departing passenger on UTA from the Horn that dawn. It was in the pub that night, back in Buckinghamshire, recalling my wasted couple of days, that everybody asked “Why didn’t you just give them baksheesh? ?” and I had to lamely reply that it simply hadn’t crossed my mind! I haven’t lived in the corrupt zones of the world, and am not really fit to travel in them, I now realise. OF COURSE, a ‘dash’ would have let me in – and now I divine the hidden meanings of their strange and oblique questions as they fruitlessly tried to lead me to the fulchrum point of the moral see-saw in that hadean aerodrome tent. A waste of a thousand pounds, as I recall! Though I did get some new mosquito types for my collection and I wasn’t bundled in to the Foreign Legion, so there was much to be thankful for. Young Pemberton collared two odd Greeks on celluloid, during his forays into the capital during the days of rationing. A 1950s American Buick Eight convertible parked in Upper Regent Street in London bears a baffling, plain, T 38 plate, unlike anything we know. John was certain it was Greek. Was it a Thessaloniki Port tourist entry plate? May 31, 2019 Yes – this transpired to be just that, and our Stoel albums provided another example from the same period – T 62, carried by a 1949-ish Hillman Minx. Well – there’s another series we had not known of! Thessalonika Temporary Importation registration, free of duty. 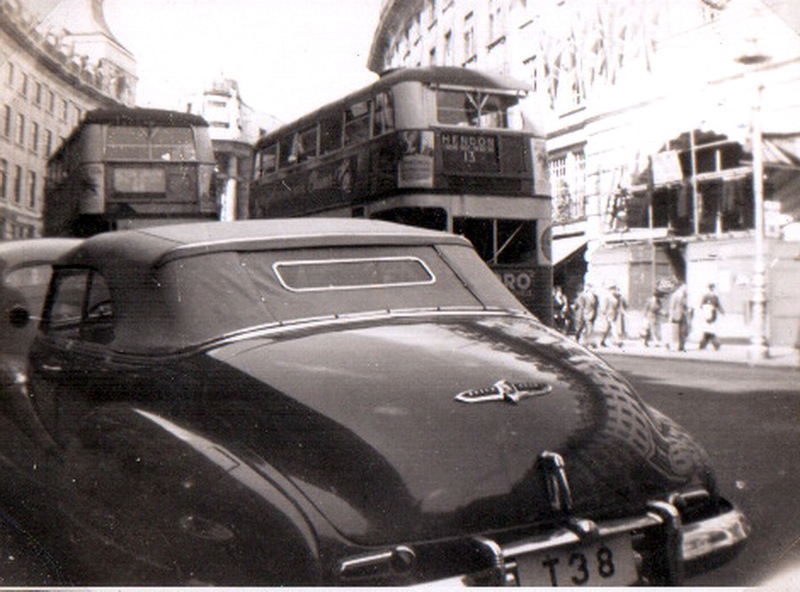 A Morris Oxford MO was the choice of transport for this 1940’s-era British diplomat in Athens, seen on leave in UK. Embassies were not coded in those times. 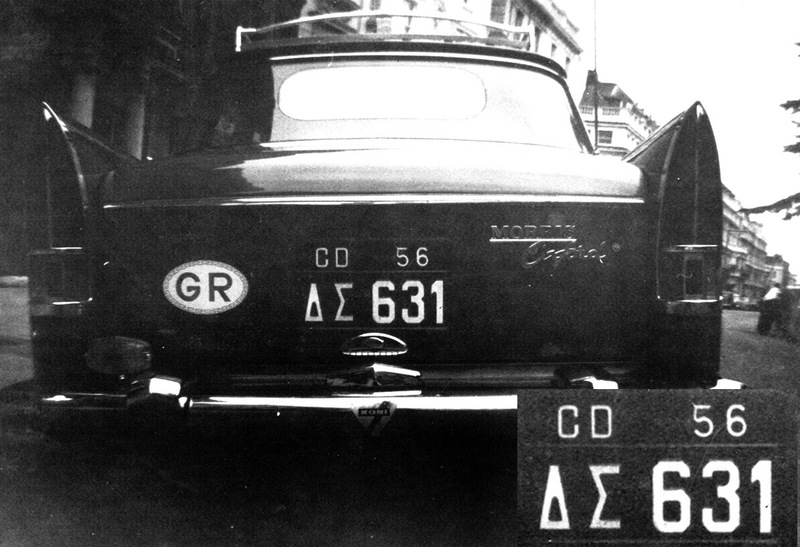 Below; Not many years later, in about 1958, the rare Greek diplomatic was photographed in Earls Court by VB. Also on a Morris Oxford, but the later, Farina-designed 1960s version. A Farina-designed Morris Oxford from GB Athens embassy, in about 1958. VB archive. 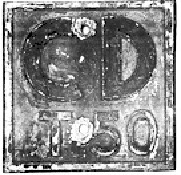 The 56 on these plates gave the year of their first issue only. 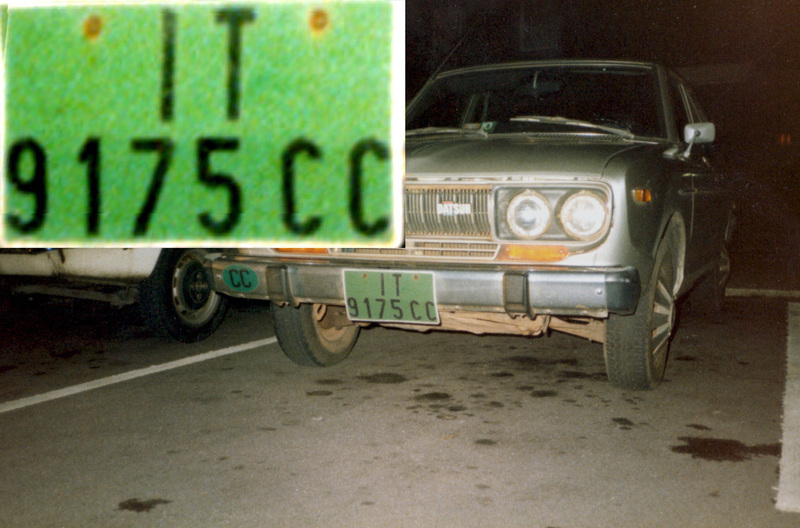 56 continued to be issued until they were replaced in 1969 with similar (green) plates, but now showing ‘69‘. This ran until about 2011, still marked ‘69‘! So the date meant nothing. The DS transliteration of the Greek dip. plates abbreviates ‘Diplomatikos Somos‘ or ‘Diplomatic Body‘. Greeks are not keen to use Latin-based words (Corps), when they have their own, older language! 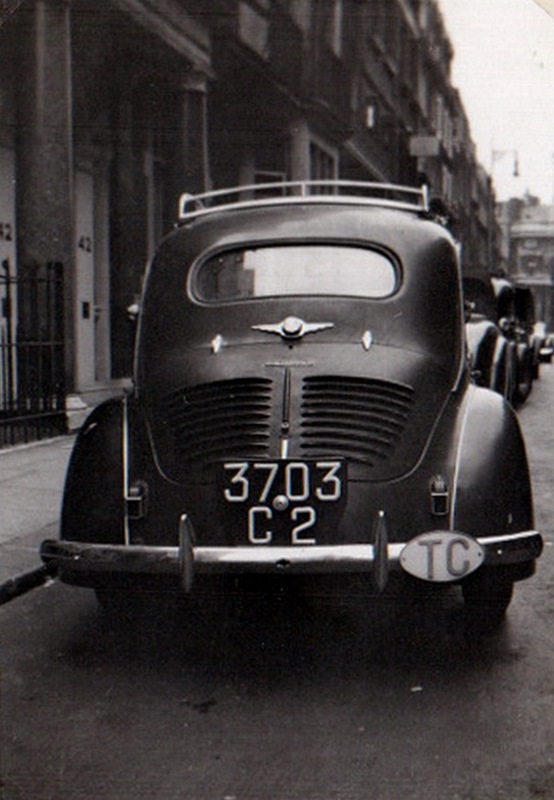 T-4145 is seen here in 1940s London. Standard 14 or Daimler(?) 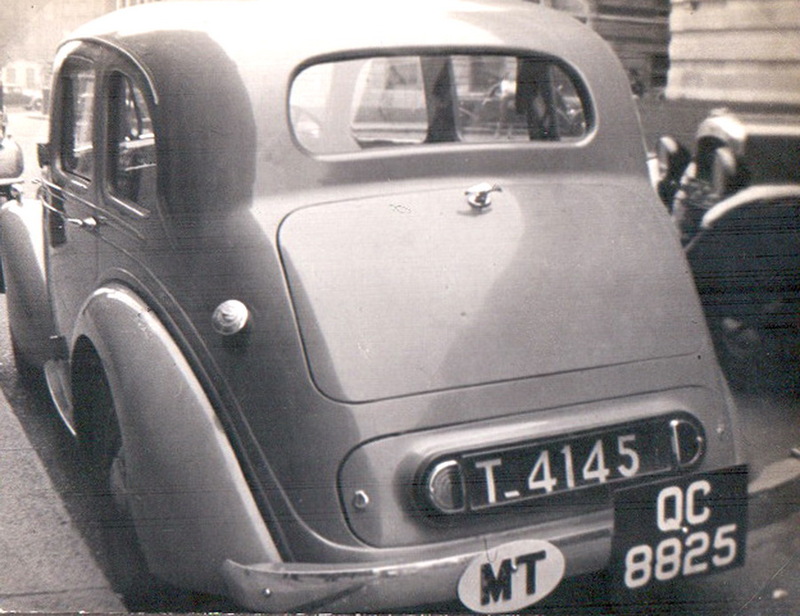 T-4145 from Tangiers, in Oxford during 1947. 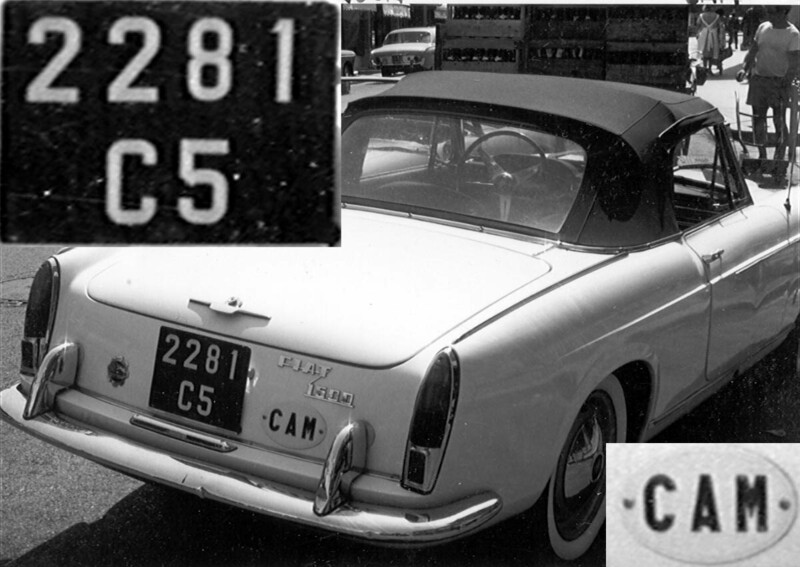 Also bearing a British Foreign-Visitor’s registration, QC 8825. An example of a territory which was not party to the treaties permitting free circulation of foreign vehicles, was the TANGIERS international enclave, and to visit Britain after the WW2, this owner was given QC (foreign visitor to Britain) plates to permit his entry. 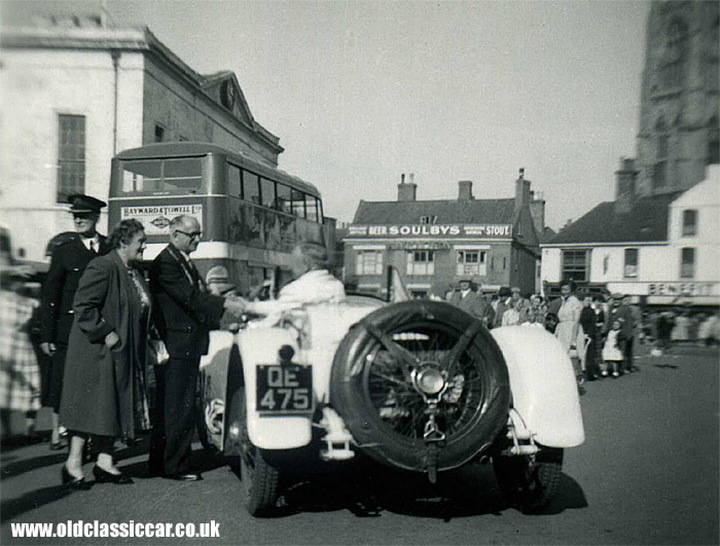 Q-C was allocated to, and handed out by, the the Royal Automobile Association (RAC), as were Q-D and Q-H. 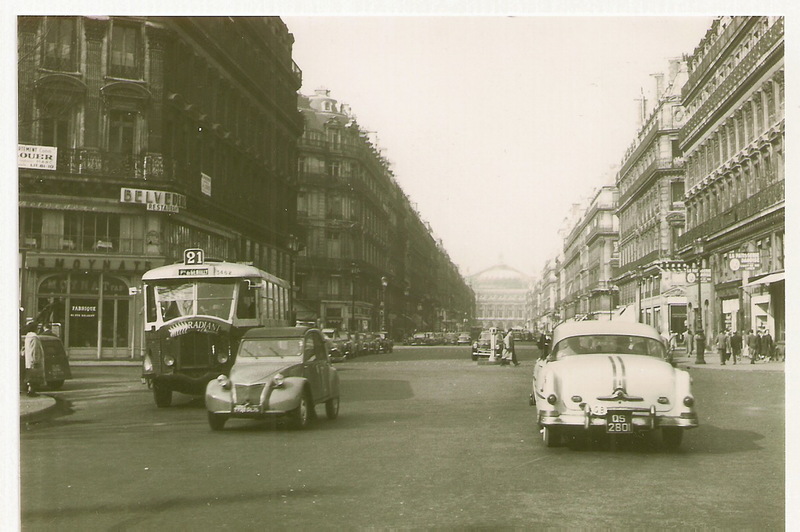 The RAC and AA auto clubs assisted travellers with the considerable documentation required for international travel in those times – Motor Insurance, Carnets (partly to prevent the sale of cars in foreign countries), supply of International Ovals (seldom available in the originating countries) and so on. T 50 & T 11259. Evidence of diplomatic activity in TANGIERS is given by these pictures below, 11259, circa 1953. The system existed until 1956, when the TANGIERS internationally-administered zone was re-incorporated into the Kingdom of Morocco. You have to be fairly elderly, by now, to have seen one of these in circulation! Most interesting explanatory notes are given below, by Thierry Baudoin, who studies the Conventions regulating international vehicle movement. (See Comments). T 11259 from the MV archive. 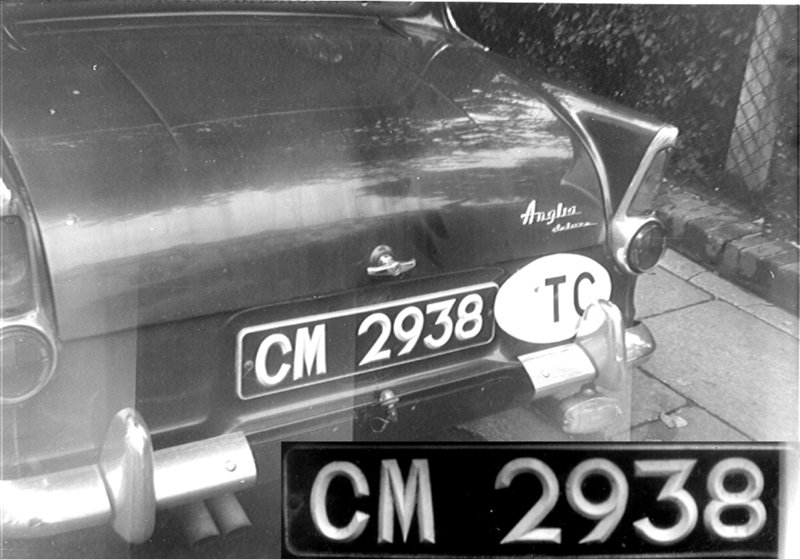 In support of a member’s sighting of an Indian Jeep in London in the 1950s, bearing Hindi scripted plates, we see another example in 1965 New Delhi, snapped just as a camera came to the end of a roll of film. The Jowett Javelin was quite a rare car in Britain, using a flat-four water-cooled engine and many advanced features. 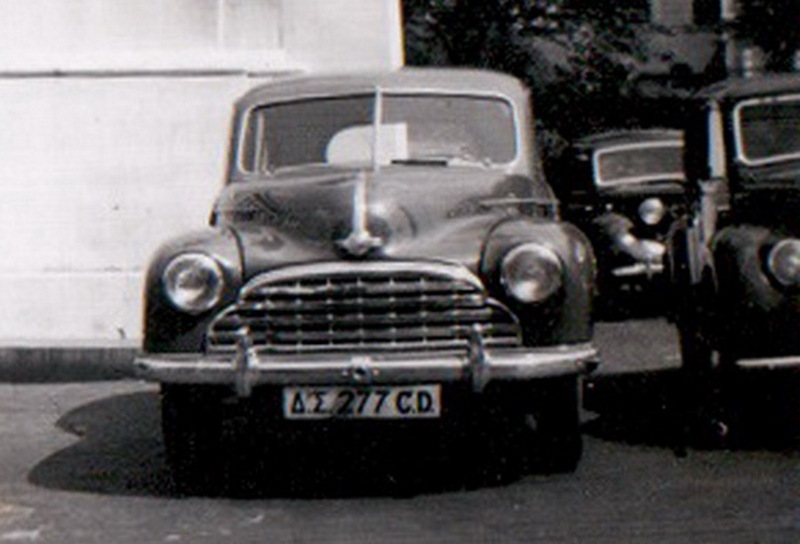 It would have been very difficult indeed to keep a 1951 car like this, still running in India in ’65! Madras-registered Hillman in 1964 Plymouth. BRQ 714 – one of the last grand cars to be permitted to leave India for international collections. and a type never reported before or since, seen in Earls Court, London, in the 1960s, using West Bengal plates in white on red and marked with (TRYP). 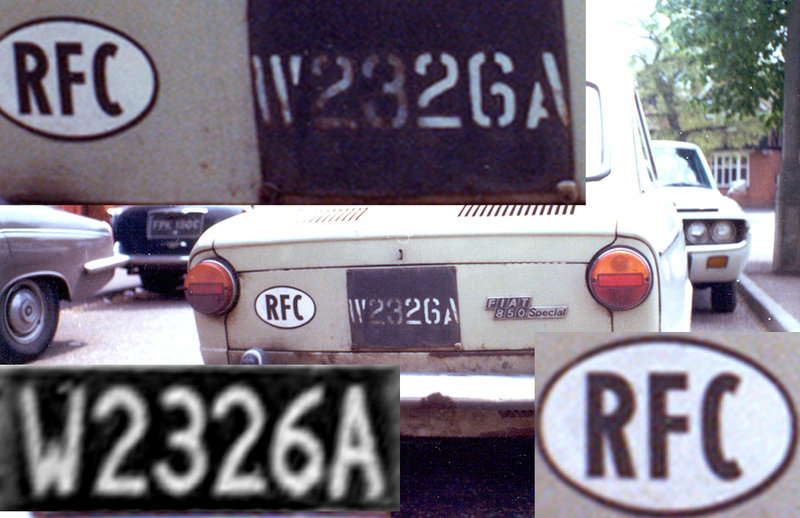 WBD 6714 – VW Kombi overlander in 1960s London, with an unexplained plate type . I have concluded that an Australian overlanding team was arriving by ship at Calcutta (WB was for West Bengal until 1973) and was required by the customs at port of arrival to mount temporary transit plates, perhaps because they could not show documentation proving paid-up overseas licencing. (Bad luck!) 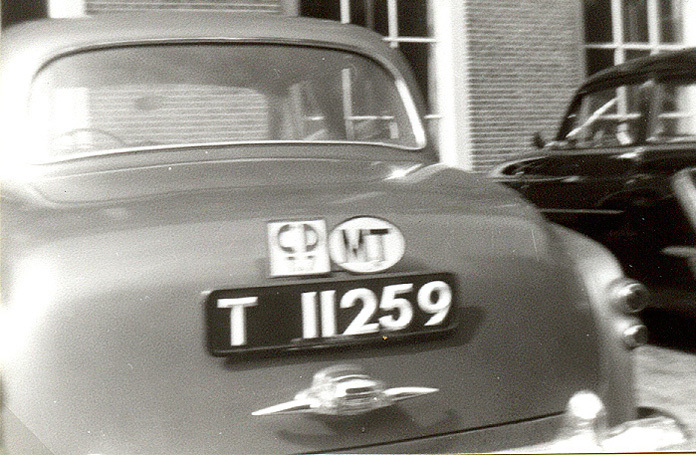 They might have had to buy a carnet to transit India and the abbreviation TRYP on a red numberplate (rear only) might have indicated the temporary nature of the registration. It was all painted in the exact style of the period, the letters shorter that the numerals…..
You are currently browsing the archives for the Temporary Importation category.